Mary Soule was born in 1925 in Little Falls, New York. She spent her childhood in Little Falls, until she married and moved to Richfield Springs, New York. Mary has spent her entire life living in rural upstate New York, and both she and her husband have worked for several local businesses. Her husband worked for a local saw mill and eventually worked for the Library Bureau. This is the organization that made much of the furniture in the NYSHA Library. The Soule’s had five children who all remained in the region and attended local colleges. 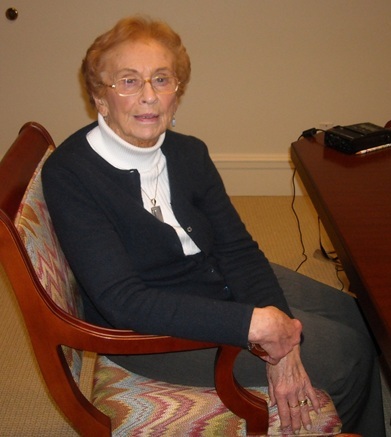 Though now 86 years old, Mary still works and is currently an employee of the New York State Historical Association in Cooperstown,New York. 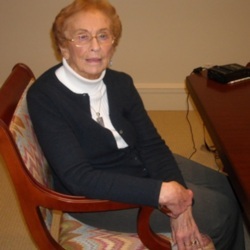 Mary’s career spans the entire second half of the 20th century and she has seen computers rise in importance over the past fifty years. While working at Mohawk Data Science (MDS) in Herkimer, New York, Mary became one of the first people in her department to be trained to use the computer. Mary also discusses changes within institutions she has worked for, such as the New York State Historical Association. During her time at NYSHA, the organization has grown and professionalized. Educators are no longer “guides” and programs have shifted from arts and crafts to historic interpretation. Another important aspect of Mary’s interview was her discussion of her home life. Her childhood involved attending a small parochial school, going to school dances, and being a cheerleader. Her own children enjoyed roller-skating, swimming in Canadarago Lake, camping, and horseback riding. She discusses small town life in Richfield, pushing her baby carriage up and down Main Street, and shopping at the local A&P. Overall, Mary’s story showcases the changes that have taken place in rural communities over the past 50 years, both in the workplace and in the home. AW: This is Abbie Wilson recording an interview with Mary Soule for the Cooperstown Graduate Program on November 17th 2011. We are at the NYSHA library in Cooperstown, New York and I guess we’ll begin our interview. I suppose my first question would just be a relatively simple one: what year were you born? MS: I was born in 1925. AW: 1925. And where were you born? MS: I was born in Little Falls, New York. AW: And is that where you grew up? MS: I lived there until I got married. AW: Ok. Could you tell me a little bit about what it was like growing up in that time period in Little Falls? MS: Well, it was rather hard because it was during the depression. I was very small but I still can remember certain things about it. My father lost his job and I remember that we owned our house and there were two women that had a store, probably two blocks down from our house. They took the mortgage on the house and therefore we could sign for any groceries that we needed. And then eventually my father found a job as a caretaker in Moreland Park in Little Falls. And so we lived there probably five years, while he worked there. AW: What was Moreland Park? MS: Well, it was a park, probably a couple of miles outside of town. AW: And where did he work before he was at Moreland Park? MS: He worked in Cherryboro which made pasteurizers and creamers and things like that for milk. MS: It was all stainless steel. AW: What was school really like for you during that time? Elementary school to start I guess. MS: I went to Saint Mary’s school and that was a school that went all the way up through 12th grade. I remember when we were small we lived on Moreland Street, which was in town. But then, as we got a little older, we lived in Moreland Park and that was probably two miles out of town. We used to go home for lunch. And we used to walk all the way home unless we got a ride with a man who lived above us at the park. He was a police man and he had a motorcycle with a side car. And so he used to put us in the side car and drive us home. And then, in the winter time we used to ride down the hill on our sled and then drag it all the way home at night. You know, it was all up hill. And I think I lived there until I was probably fifteen and then we moved back to our home on Moreland Street. AW: So when you weren’t getting rides from the man with the motorcycle, you walked to school? MS: We walked to school. AW: Or took a sled? AW: Was that common for most the students at your school, to walk? MS: It was until they finally got a cafeteria in the school. But, for a long time they didn’t have one. They even didn’t like you bringing your lunch, for some reason. I don’t remember why at the time. AW: So getting the cafeteria was what caused most kids to stay at school then? They didn’t walk back and forth anymore? AW: What was your favorite class in school? MS: Math. And then English, I think. I didn’t like history very well at the time. AW: Was there a reason why math was your favorite? MS: No. I guess I was fairly good in it and that was the reason probably. It was easy for me. It was easier than some of the others. AW: And do you remember why you didn’t like history? AW: Just didn’t? What sort of clubs or activities did you have at Saint Mary’s? MS: I don’t really remember any clubs. When I got older in high school we had basketball, and I was a cheerleader, but we didn’t have football or anything like that. And we used to have an occasional dance. And the high school was right across the street, so we used to go to the high school dances. AW: Was your school just for girls? MS: No, it was girls and boys. AW: And when you say you had dances with the high school, was it to just get more kids at one event? MS: Well, no, not necessarily. It was just that we didn’t always have a lot of dances. We might have one a month or something like that, where they’d have one every Friday night or something. So we used to go to their dances. AW: About what size school was it? What was your graduating class size? MS: Not very big, about 30. AW: So you were a cheerleader. Did you participate in any other extracurriculars in high school? MS: No. I just played basketball a little bit, but that was all. AW: And what did you want to be when you grew up? MS: Well, I thought about being a nurse, but I never did follow through on it. AW: Was there a reason you wanted to be a nurse? Was there something about that that you found interesting? MS: No. I guess I didn’t go because I was going with my future husband, so I just didn’t go away. AW: How did you meet your husband? MS: I met him at one of the dances. He was from Herkimer and he and his friend came down to Little Falls and I met him there. AW: How far away from Herkimer was [Little Falls]? MS: Oh, nine, ten miles, something like that. Not very far. AW: And you met him at the dance? AW: Do you remember that evening? AW: Did you talk to him first or did he talk to you first? MS: No, he just asked me to dance. AW: So, why did you move to Richfield Springs? MS: Well, when we got married he was living in Richfield Springs. His father bought this huge house there. It’s called Bella Vista and it’s on the left-hand side going out of Richfield Springs toward Albany. And he bought it for the wood lot behind it, because that’s the business he was in. And when the family saw the inside of the house, they wanted to move there. And it was a beautiful house, but it was in a lot of disrepair. So, they all got together and cleaned it up, and of course you got some help. But it had beautiful woodwork and lots of big rooms. That’s why they moved there. And then, when we got married, they had three rooms on one side on the second floor that they had made it into sort of an apartment. And then, kind of outside those rooms was a huge hall and at the end of the hall was a large bathroom, so we moved into that apartment. AW: And how did you feel about moving to Richfield? Were you excited? MS: I really didn’t mind, because I was working at the time in Cherryboro, the same place I said my father worked, in the office. I traveled from Richfield. My husband worked in Herkimer, so we traveled together to Herkimer and then I took a bus to Little Falls. I did that for two years, until I was pregnant with my first child. AW: Could you tell me a little bit about what it was like raising small children in Richfield during that time period? MS: Well, I don’t know. AW: Was there a lot of families in Richfield at that time period as well? MS: Yes, there were a lot of families. Of course, it was hard at first because I didn’t know anybody. But then, little by little, I did get to know people. And I lived in Bella Vista, which had a terribly long drive-way, so when I would walk the baby down street I would have to push the carriage all the way up. It was really hard, because the driveway wasn’t blacktopped or anything, it was kind of crushed stone. It was pretty hard, but I used to do it, just for exercise. AW: How did you meet most people? You said you met them little by little. MS: Well, I don’t know how I did meet them. I think my husband knew quite a few because he had lived there at least three years before we moved there. Of course, most of them were married also, so I just met their wives and they had children. So that’s how we got to know people. AW: Was there any organizations in Richfield that you joined when you first moved there? MS: Not when I first moved there. Well I joined a bowling league and I bowled for several years. And then later, as my children got older, I joined the Lioness Clubs and I was in that for several years. AW: Why did you join the Lioness Club? MS: I don’t know. I just kind of thought it was a good organization and so I joined. I had friends who were in it. AW: When you first moved to Richfield, where was it that people like yourself went to do their shopping? MS: Well, we had an A&P, which was right on the corner on Main Street, right across from the park. And, I don’t know if it was before that or after that, but there was also a Victory Store, which doesn’t exist anymore. I think it turned out to be a Great American after a while. But that was down, probably a block, from where the A&P was. AW: What about for things other than groceries? MS: Well, there was a department store there called Ruby’s and it was owned by a man named Elliot Hellphant and they called him Ruby for some reason, and so that’s what they called the store. And he had all kinds of clothing, so we did a lot of shopping there, unless you went out of town to Utica or someplace. AW: So Utica is where you would go for even further away kind of stuff? AW: Was Ruby’s a relatively good size store? MS: It wasn’t terribly big, but it seemed like they carried just about all kinds of clothing. And good clothing. People really liked his clothes. AW: Do you remember what happened to Ruby’s? I mean, it’s not there anymore. MS: Well, he ran it for years, until he got older and he wanted to retire. I think he did sell it to another man, and I can’t remember his name. Then he got sick and then that’s when they closed it, I think. AW: So when you shop for things now, do you generally go all the way to Utica? MS: Yes, I usually do. AW: When your kids were small, did you travel outside of the region for family trips? MS: Not often, because we had five within seven years and it was a lot to travel with all five of them. We did take a trip once to Michigan to see my husband’s brother. It turned out to be ok, they weren’t too bad. AW: What sort of things did you do in Michigan, besides see your husband’s brother? MS: Actually, they lived on a farm. Well, it wasn’t really a farm, but it was outside of town and they had horses, so the kids enjoyed the horses. We actually didn’t do too much because we just stayed around the house and visited with them. AW: What were the places that were fun in the area, in upstate New York, that you would take your kids. MS: I don’t really know. The Catskill Game Farm. MS: Well, it’s down in the Catskill Mountains and it has all sorts of animals. Just zoos, that’s about it. AW: Was there roller skating rinks around here? MS: There was a roller-skating rink. It’s on the east side of the lake. In fact, that’s where I live now. It was not even a tenth of a mile away from me. When we first moved there my oldest one was probably three and the other one was maybe one. But after I had more children and they got older, then they used to walk over to the skating rink and skate. But it almost closed before they really got into skating much. AW: Where did your kids like to go when they were growing up in Richfield? How did they spend their time? MS: Well, they’d just go to activities at school. Baseball games and basketball games and football games and things like that. MS: Dances at the school. AW: Were you working outside the home when your children were small? MS: No, I didn’t work until my youngest was five and went to school. And then I went to work at Buchanan’s Gift Shop, which was actually a hardware store in Richfield Springs, but he started a gift shop. And he had just started it and I went to work there. I was the first one who went to work there. So my oldest was probably thirteen at the time, so he watched the younger ones when I wasn’t home. They got home from school at 3:30 and I got home at 5:00. AW: What was it that made you decide to take that job? MS: I don’t know, I just thought that I had the time then. Not that I had an awful lot of time, but I still did. I just kind of felt like I’d like to do it. AW: Were there other jobs in Richfield that you were considering, or that one was just open? MS: No, it was open and I just talked to a friend of mine who worked there in the office and she thought it might be a good job for me, so I went and took it. And I worked there for four years and then I got pregnant for my youngest daughter, so then I stopped again. When she was thirteen I went to work in Herkimer. It was called MDS, when I first went there. That was in 1980, I believe. Then, I’m not sure how many years later, it was sold. And it was sold to Mohawk Valley Sciences, or something like that. And then they sold it to Momentum, and then that was the end of the business. They just closed. I worked there, I’m not sure how many years, probably fifteen, and that’s when I came to work at NYSHA the first time. AW: What were you doing at that job at MDS? MS: I was in the office. AW: What would that entail, a day at the office? MS: I don’t know. It was a computer company. And they used to have a lot of papers, data that they would keep. We would have to enter it on the…no, it wasn’t on the computer then because it was just things that you had to enter into books. It was just general office work. Then, I hadn’t been there over two months I think, when my sister who worked in the front office, she worked for the executive, she was an executive secretary, she got killed coming to work one day. And so they came in and told me. And so, later on, the girl who worked in what they called Department 100, which was a department that had 100 women in it, she took care of all the paperwork for these women. She got offered the job that my sister had. So they asked me if I would take her job, and I went out into the office. Then, I was there for a while and then I went up to the front office and worked there for a while. And then, one of the men who I worked for had taken another job, and so I went to work for him. But that was back out in the factory again. So that was where I was when I got through. AW: What was the department of 100 women? What were they doing? MS: They used to put the chips on the boards for the computers. They had a section of it that they called the bless area. And that sort of meant that they blessed the computers, they checked them all and if they sent them through and said they were alright, they blessed them. That’s what they said. AW: Did they purposefully hire women for this computer work? MS: I don’t know whether they did or not, because there were some men in there but I don’t know what they did. I can’t really remember. But I do know there were a lot of women in there. AW: What sort of training did most of those women have to be doing things with computer chips? MS: I don’t know that they had any when they came in. But they might have. I don’t remember that they did. But they used to put the chips on the boards and I’m not too sure what else they did. AW: Were you ever doing anything there besides office work? AW: So after that you came here to NYSHA. Could you tell me a little bit about your first couple of years here at NYSHA? MS: Well, Bruce Reinhold, that used to work here, hired me and he was in charge of the [guides]. They used to call them the guides, because they would guide people in the museum. But in the winter time, when the museum closed, they would teach different crafts to schoolchildren. So I just taught the different crafts. There was a gift shop at the front. As you come in the museum now, to the right where the clothes rack is or the clothes room, that used to be a gift shop and the ticket office. So I used to occasionally go in and help in the gift shop, or in the ticket office. So then, eventually, I worked most of the time in the ticket office. In 1995 when they built the new addition on for the Indian exhibit, of course the museum closed for two years. So then I went over across the street and worked in the ticket office there for the two years. Then when the museum opened again I came back to the ticket office. And I worked there for I don’t know, probably five years. Then, the telephone operator, I used to substitute for her when she went to lunch or if she was off. Then, she got a different job, still in NYSHA but a different one, so I applied for that job and I got that job. And I was on the main floor then. It was right across from where the kitchen is now. And where the kitchen is, is where I believe was the staff kitchen. And then I moved from there into where the room is where they store things for the kitchen, you know where that is, across the hall? Then, I don’t know if they were going to use that room or what, then they moved me upstairs and I was in the office where Melanie Bruce is now. So I was there for probably, I don’t know, five more years. I worked altogether 17 years here. AW: What would you say the biggest change is from the time you first started at NYSHA to how you see the organization today? MS: Oh my goodness. There have been so many changes. AW: Well, we can start with the first one. MS: I don’t know, it’s so hard to remember even. I mean, the guides. They were just people who came in and learned about the museum and showed people around and I don’t know. I should have had some time to think about this. The education department wasn’t anywhere near as large as it is now. The whole complex wasn’t as big as it is now. They have a lot more employees than they used to have, and a lot more departments and the departments are bigger. AW: Did you enjoy your work with the education department when you were a guide when you first started? MS: Yes, I did. Sometimes it was pretty hard with the seventh graders, they were pretty tough. The little kids were great. AW: What sort of crafts did you do with them? MS: We did scherenschnitte and quilting and reverse painting. AW: What was that first word you said? MS: Scherenschnitte, the cutting of the paper. You fold paper and then you cut little designs out of it then you open it up. AW: Sort of like how people make snowflakes? MS: Yeah, but it was just a little bit different than that. It was like a German craft I think. MS: That’s where they do reverse painting on glass. Where you paint it and then you look through the glass and you see the painting on the front of it. We have some that are done by artists in the collection. AW: What was your training like for being able to do these crafts with the kids? MS: Not much. I mean, I sewed all my life, so the quilting wasn’t hard and the scherenschnitte wasn’t hard either. Well, none of them really were except that you kind of had to know something about it. So the women who were here taught me how when I came in. AW: What was the process like for going from the education area to being in the office again? MS: Well, I answered the phone. That’s what I did all day long. And I took reservations for everything. It just was different than it is today because people just use the phone all the time. Now they might have a voice mail, but I don’t even know that they did at that time. They must have had something. I took a lot of reservations for things and had to find people when people called for them. AW: So you had to be at the phone all the time? AW: That’s interesting. What would you say maybe the biggest changes are in Richfield, since you first moved [START OF TRACK 2, 0:00] there? MS: Well, when I first moved there, there were some of the huge hotels still left in Richfield. I mean, when Richfield was in its heyday they had huge hotels that gave sulfur baths, so people from New York City used to come there every summer and just stay the whole summer. And when you went by they would all be sitting on the porches in the hotels. And then they just got so that they were empty. Then, pretty soon one by one they came down. And all of the other buildings were built. There was the Palmer House and the Erlington, I believe it was, and then there was a big one behind the park. I can’t remember what the name of that one was. But they’re all gone now. And the two grocery stores that were there, they went out. Great American came in up across from the what was the Methodist Church at that time, I think it’s something different now. Now that grocery store isn’t there anymore, now Price Chopper is on the other end of town, and that’s a dollar store. I suppose people have lots more cars than they did at that time. I don’t know, I think people used to walk a lot in those days. AW: What were some of the stores, besides the department store that you talked about, that were in the downtown/main-street area of Richfield Springs? MS: Well, there was what they called the Five and Ten, which was a variety store. And Diamond’s was the name of the people that owned that. And they were there for a long, long time. You used to be able to find things for five cents and ten cents and twenty cents you know? They were located next to Ruby’s. I’m trying to think what other stores were there. There was Potsners, a little independent grocery store and that’s of course no longer there. And then he and his wife became a milk man. A milk man and woman. So they delivered milk. Jimmy Mehan’s insurance office was there on Main Street. Chef Diner has been there a long time, and there was another diner down farther. What did they call that? I can’t remember what they called it, but that was there for a long time too. And there was the Park Inn, which is still there. And Cater’s was an eating place, and that’s where I believe Kinney’s is now. Kinney’s drug store. AW: Did you ever stay at any of those…well, living in Richfield I suppose maybe not, but did you ever stay in any of those giant resort hotels? AW: Did anyone in Richfield ever go in any of those sort of places? MS: I don’t know. Some of them must have worked there. I didn’t happen to know anybody that did. My grandmother worked there years and years and years ago, but that was before I ever got to Richfield. But I’m sure that people from Richfield worked there. AW: When would you say those hotels really started hurting and closing up? MS: They were beginning to hurt when I went there. I went there in 1948, and I’m sure they were beginning to hurt right then. AW: Was there anything, from what you could tell, specifically why these places were closing? MS: No, I don’t really know. Because maybe they decided they didn’t like the sulfur baths anymore. I don’t know. AW: Could you maybe tell me a little bit about what your husband did for a living? MS: Yes. He was in the lumber business for a long, long time. He worked for his father when he was still in school. His father worked in Dolgeville at a saw mill. And he worked there, and on weekends he’d go up North and he would drive a log truck and fill it with logs and then he’d drive it back to Dolgeville. And then his father got this job at Library Bureau, and they wanted a saw mill built. So he was building the saw mill and then he got a blood clot, so he was laid up. So my husband quit school and went to work down there so he could keep track of the things that were going on. When my father-in-law got better he went back to work, but my husband never went back to school. He stayed there and they finished building the saw mill. And then he became just a lumber handler, but he worked nights. He worked more than nights, he put a lot of overtime in. Then little by little he got to be supervisor over the saw mill. Then his father retired, so he became the supervisor in the saw mill. Then later on he built a dry kiln, for drying lumber. And what they did at the Library Bureau, they made library furniture, which a lot of it is in the NYSHA library. He worked there for many years but he also bought all the lumber, all the logs from the Adirondacks. So he used to go up and look at the logs and check them out and buy them and measure them and have them loaded, and then bring them down to the mill. And then they had a saw there, of course, it was a saw mill, and they’d saw them into boards and put them in the dry kiln and dry them, and then they would send them into the factory where the men would make furniture out of them. They had wonderful craftsmen in there, they could do anything and the finishes were wonderful, and the products. Then he became a vice president of the whole complex. But at the same time they were having troubles. It was owned at first by Remmington, then they sold it to this private company, which didn’t really do anything with it. In order for this private company to get it, the bank said that they wouldn’t sell it to them, they wouldn’t give them the loan unless they kept the three top people there and that they should be vice presidents. And that’s when my husband got to be vice president. He really didn’t want to stay when this other company came in, but he had to for that reason, because he didn’t want all the people in the plants to go be out of work. He did stay for three years, they said he had to stay for three years and then he got through. And then he retired. And then he went to work for Walter Rich on the railroad over here and my son was the executive vice president for Walt Rich and so he got a job. Actually it was in Richfield Springs, they had a mechanical section up there. And they needed somebody to go to Utica for parts and go to Binghamton for parts and do things like that, so they hired him for that. So that’s what he did all day, he would just have to go places and pick up things. He did run the train for a while, I guess that was before he went on the mechanical thing. Yeah, he became the engineer. AW: He drove the train? MS: Yes. He did that for two or three years. They had a stone train that they used to go and get the stone from the quarry, and then they had to bring it to a destination where the trucks would load it. He liked it, but it was a twelve hour day and that was really rough. But he did keep it up for three years or maybe it was two years. Then he said he just didn’t want to do that anymore. So then he got the job in the mechanical department and he worked there for eleven years and he retired from there. AW: So all of this was after he had already retired from Library Bureau? MS: Yes, he worked for thirty-three years in Library Bureau then he worked another eleven years on the railroad. AW: Why did he…you said before that he wanted to quit when the company was bought. Why was it that he wanted to quit? MS: Well, he wasn’t too sure what was going to happen to it, you know? So he just kind of wanted to do something else, he had been there quite a while, so that was his feeling. AW: Did Library Bureau make a specific type of furniture, did they have a style? MS: Yes, but I don’t really know how to describe it. Most of the finishes were fruit wood, kind of a mixture, you know? But they made all the carrels for here and the stacks and tables. Of course they made them for other places too. I mean, they used to have salesmen in Texas and all over. AW: So they were nation-wide? AW: Do you know what happened to that company after your husband left? MS: No. It just went downhill. They never really improved on it and so it just went out. AW: So where did your children all end up when they grew up? MS: Well they’re all living very close around here. I have one that lives outside of Duanesberg, I have two in Clinton, New York, I have one in Cooperstown, I have one in Richfield, and one in Herkimer. I said my oldest worked for the railroad and my second son Rick was an investigator for the attorney general’s office in Albany. And my third son is a project manager for a construction company in Syracuse. And my fourth son runs a small company now. It was bigger but they kind of were downsizing. It’s for a Japanese company, from Japan. They live in Japan but they run this company. And he is running it now. It’s very small, but it’s an electronics company of some kind, I’m not too sure what they make. He does a lot of travelling to Japan and to Europe. Then my older daughter is a [teacher]. What does she teach? Physiology and something. She works for Herkimer Community College, and she teaches science. And my younger daughter is a vet tech. So they’re all doing very well. AW: Did they go to their higher education in New York State? MS: Yes, they all went in New York State. AW: What were some of the schools they attended? MS: Let’s see. David went to Morrisville, Rick went to SUNY-IT and then he went to upper division. Gary went to Eisenhower College, which was a college in Seneca Falls that no longer exists. He was the second or third graduating class from there. They had no alumni and they just couldn’t keep it going, so RIT took it over. So he’s considered a graduate of RIT now. Then my fourth son went to RIT and my older daughter went to Geneseo and she did her graduate work in Oneonta. My fourth son that went to RIT, he did his graduate work in RIT. And my younger daughter went to Russell Sage, then to Albany State. She went to Russell Sage for history and then she transferred to Albany State and then she really didn’t like what she was doing and so she moved back to Oneonta and then she went to Delhi and became a vet tech. So she’s probably had six years of college for a two year degree. AW: And do you know why they all decided to stay relatively close to home? MS: No. I think they like the area. My older daughter went and worked in the University of New Hampshire for a while. She went to Chicago first and worked in the Chicago Institute of Technology in research. Oh, I know what she teaches, she teaches anatomy and physiology. That’s it. I couldn’t think what that was. And then she went to New Hampshire, because the same doctor that was in Chicago moved to the University of New Hampshire and he asked her to come up there, so she did. And then she got married and she moved back to Herkimer because her husband is a real estate broker in Herkimer, so they live there. I don’t know. They all seemed to find decent jobs around. AW: Is that normal for students from their graduating class to still mostly be in the area? MS: I really don’t know. I know there are some, but I don’t know. AW: Was it difficult to find colleges in the area that had what they were looking for? Or was it relatively easy? MS: Well, no, because I think most kids when they go to college don’t really know what they’re going to do when they start out. And so they just kind of pick through the colleges and see which ones they think they’re going to like. They kind of have an idea of where they want to go, but half the time they change their minds as they get going. AW: What sort of higher education or training have you had over the years? MS: I haven’t gone to college, but I’ve had a lot of computer courses and things like that. But that’s about all. AW: What were the computer courses like? I can imagine over the past twenty years there must have been a lot of computer courses. MS: They were so different, you know? I can’t even remember. Lotus, and all these that had strange names. Because when I was working at MDS, I told you I was working at this department 100 they called it. So they sent a memo around to the bosses saying that if anybody knew how to use a computer, they would get them a computer. So I said to them, “Well, how are you supposed to learn if you don’t have a computer?” And he said, “Well, that’s what they said.” So there was an area out in the plant, they called it the rework center, where they used to get parts that were broken or something and they would rework them or order new ones. They had a computer out there and a friend of mine from Richfield Springs worked in that, in a different department, but that was part of his job, to be in there. So, I called him up, and I knew that nobody worked on the computer all day long. So, I called him and I said, “If I get permission to go an hour down there to work on the computer, can I do it?” And he said sure, so I asked my boss and he said yeah, so I went down and I didn’t have a clue how to even start it. So I kept calling this Don. Every time I’d get mixed up he’d straighten me out, so I just worked on it until I could get around it a little bit. So I went back and told my boss I could run the computer. So they got me a computer and then I could go to any of the classes then! Isn’t that strange? You could go to the class after you knew how to use it. AW: What year was that? MS: It was probably 1982. AW: When you were first getting computers? AW: Were there computers here at NYSHA when you first started? MS: Oh, I imagine so. I’m not sure. I came I think in 1990. It might have been 1995. AW: What sort of…once you were allowed to take the computer classes, what were they trying to get you to do on the computers? MS: Well, I suppose there was a program that was like Word, things like that. Just to do charts and things, but I suppose mostly to keep track of things that went out in the factory. You must’ve had charts that you had to fill in or something. Because when I first went there, they had the reel-to-reel , where you put one reel on. I never used them but they did have them in the factory. You’d put a large reel , about six inches in diameter, on one side and tape it over to the other side. Then they had punch cards that they put into them somehow. But then they got rid of those. AW: Were you one of the first people using the computer? MS: Well, it was quite early, I would think. Before I went to work there, of course. But I do remember that they were just starting the touch screens then. And they had so much trouble with them. But that’s when I remember the bless girls. They used to have to check them, and check them, and check them, and they’d get so frustrated, because they wouldn’t work right. But then they finally did. AW: What were the touch screens for? MS: Well, I suppose for McDonalds and places like that. AW: So they were making the touch screens? MS: They were making the touch screens. But I don’t know who they were for at that particular time. AW: And what made you want to be able to use the computer? Was it something your supervisor asked you to figure out? MS: No. It was just something new and I thought it would be fun to learn it. And they used to have classes right there at MDS. There was another building across the street, and they used to have the classes there. And then later on they had more classes in Utica. There was a big factory that was no longer in use, and so they used to hold the classes there. AW: Let’s see…Did you ever want to work in an area here at NYSHA, or at MDS actually, that you didn’t get a chance to go into? MS: I don’t think so. I was pretty happy in what I was doing. AW: What would you say one of the things about your job doing administrative work that most people wouldn’t realize is part of the job? MS: Do you mean here? MS: Oh, they have. Because they never called anybody an administrative assistant, they were always secretaries. AW: There’s a good way to start. MS: I don’t know that the job has changed that much. It’s very similar to what it used to be. But there’s just a different title now. Which is good, because a lot of them really have a lot of hard work to do. I’m trying to think of what I want to say. I just think that it has changed. AW: Is there maybe anything else you’d like to add about a topic we haven’t pursued? We’ve sort of been all over the place but we have a little bit of time left. MS: Gosh, I don’t know. I have twelve grandchildren. AW: You have twelve grandchildren? MS: And now they’re getting older. AW: Who was your favorite teacher? MS: Well, when I was in school we had nuns. You know, nuns at the Catholic school. There was one in particular, her name was Sister Rose, and she was the Latin teacher, and she was by far my favorite. AW: Why would you say she was your favorite? MS: I don’t know. I took three years of Latin mostly probably because I liked her. MS: No. You had to take a language, and I took one year of French and I didn’t care for the French teacher at all, so I to take two years of it in order to get credit for it and so I just dropped it and took Latin instead. AW: Why were you enrolled at that school instead of the public school? MS: I don’t know. Because that was where all my brothers and sisters went. My brothers and sister. AW: And so your parents just decided that where everyone was going? AW: Were there a lot of private schools in the area during that time period? MS: Well there were in different towns. There were parochial schools in most of the small towns. Now they’re mostly all gone. Saint Mary’s was there for years and years and years. And then, when things got bad, they just couldn’t support it, then they eliminated the high school and just went to eighth grade. Then they went to sixth grade and then they just couldn’t keep it any longer. So now the building, it’s a huge stone building in Little Falls, it’s turned into apartments. AW: Do you keep in touch with anybody from when you were growing up in Little Falls? MS: Well, not really. I used to. We used to get together every once in a while and we’d have reunions. I don’t know, you kind of drift apart and you get new friends. I guess everybody does. AW: I’m trying to think of a good closing question. What would you say one of the best things is about living in a small town in Upstate New York is? MS: Well, it’s quiet. You can travel quite a distance without having a lot of traffic. [START OF TRACK 3, 0:00] I don’t know, of course, I live on the lake and it’s just beautiful there. My children grew up on the lake and they had lots to do. They used to swim in the lake and we had woods up across the road from us and at that time the kids used to take their tents up there and sleep overnight. And when my girls were growing up they and their girlfriends would ride their horses up and take their dogs, and I’d take the camping equipment up with the car and they would spend the night and you never worried about them, as far as anybody bothering them, but you wouldn’t dare do that today. It was a lot different. AW: Your daughters’ had horses? AW: Did they belong to your family? MS: Well, when Becky was thirteen she got her horse, and she had it in high school. Then of course she went to college and we sold it. And then Pat, when she was eight years old, she found this pony. It was down behind a friend’s house in a pasture and she used to go down to our friends and go down in the pasture with the horses and make bridles out of hay twine. She’d get on the pony bare back and ride it all over. So when they were going to get rid of the horses, my friend called the owner and said “Are you going to get rid of that little pony?” And he said, “Yes.” And she said, “How much would you take for it?” And he said, “$50.00.” So she called us and we said ok, we’d take them. So she had him, and she used to make jumps in the backyard and she’d jump him and then she wanted a horse. So we kept the pony and got a horse. And she took riding lessons. So she had a horse until she was well into high school, and then she decided she didn’t want him anymore. So, we sold him. But now, they’re both married and have two children, a boy and a girl each, and they both have horses. So they’re riding again. AW: So, being able to enjoy outside and everything is an excellent point about Upstate New York. What would you say one of the worst things is about being from around here? MS: In the city you have plays, you have a lot of cultural things. Except that we do have them in Utica, a lot of things. And if people want to see them they can just go to Utica. And also we have the opera here and things. I don’t see too much disadvantage really. I like it up here and I think some people just like the city. I like smaller towns. AW: So you don’t mind the weather? MS: No, I really don’t. I don’t mind the change of seasons. I’m lucky right now because I get to go to Florida for a couple of weeks, but I never did mind it. AW: Do you have any epic snow/winter stories from all your time here? MS: Oh yes, we’ve had a lot of snow over the years. I remember getting stuck on 28, you know? And snow drifts and having to be pulled out by the snow plow. My husband, he traveled to Herkimer for thirty-three years and he used to go through some terrible terrible winters years ago. I don’t think we have those type winters now. AW: You think the weather has changed? MS: Oh my goodness, yes. I mean we used to have some awful snow storms. Now, we get a bad snow storm and we think it’s terrible, but I think we used to get a lot more, and a lot more snow. Because 28 used to be closed a lot of the time. AW: And it doesn’t close as often anymore? MS: It doesn’t close as often, no. You have it closed once in a while, but not very often. AW: What would people do when 28 closed? MS: Well, they’d go through Ilion gorge. It’s a longer ride but its sheltered, so it doesn’t get the blowing that 28 does. AW: Let’s see…I already asked you if you had any additional thoughts. Well, you work in a library, what is your favorite book? MS: I don’t know, I think I got lots of favorite books. I don’t really know. AW: What’s your favorite type of book? MS: I like history. I like historical novels I guess. I also like biographies or autobiographies. I read a lot. AW: Did you see yourself working in a library? MS: Well, I think the only reason I was over here was because they needed somebody at the desk and they were getting so they were thinking about changing the phone system I think. So, I came over here and I was here about two years when I got through. AW: Did you ever work over at the farm, over at The Farmers’ Museum side? MS: I never worked at the farm itself, just at the ticket office. AW: So they didn’t have any of your craft kind of programs over there? MS: Well, we always worked over here for those. Of course, we always worked Harvest Festival and things like that. We made the cider or the wassail for years, Bev Olmstead and I.
AW: You said wassail, they usually do that during Harvest Festival? AW: I always had that at Candlelight Evening. MS: Oh, at Candlelight Evening. Yes, that’s right. But we did work Harvest Festival too. But no, we made that for Candlelight Evening. AW: How long have they, at least as far as you know, been doing Harvest Festival for? MS: Gosh, I think from the time I was here I’m pretty sure. AW: Is it different than it was when you first started? MS: Well, I wasn’t too involved in it at first, so I really don’t know. But I’m sure they have some changes. AW: Well, is there any maybe final remarks that you’d like to say about anything at all? MS: I can’t think of anything. MS: Yeah, right. Nothing to say. AW: Well thank you very very much for agreeing to sit down and speak with me, it means a lot to the graduate program to be able to speak with community members. So thank you again for your time. AW: And I’ll be typing up your transcript so you’ll have a chance to look over it and giving it to you so you can look at it and then the final product will be at some point in December. Thank you very much. 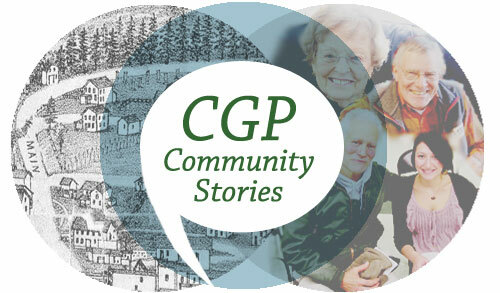 Abigail Wilson, “Mary Soule, Novemember 17th, 2011,” CGP Community Stories, accessed April 25, 2019, http://cgpcommunitystories.org/items/show/111.